Originally from Chicago, Father Mike was raised in the Jewish tradition. He took a detour along the way and has been an Episcopal priest since 1978. Father Mike has served in seven Episcopal schools in four states, the most recent being Canterbury Episcopal School in DeSoto, Texas. Fr. Mike has also served in diocesan staff positions in Chicago and served in long-time supply and Interim positions in many churches. In addition, he served as chaplain at Kennedy Airport, worked with youth in juvenile detention and various specialty camps. Additionally he has served as spiritual director, and provided spiritual mentoring for those who feel called to ordained ministry. 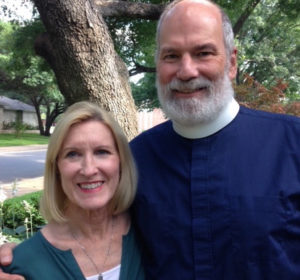 Father Mike met his wife Susan in college and they have been married for 44 years. Susan has a Masters degree in learning differences. She has worked one on one with students from kindergarten to college. They have two grown sons who currently live in Austin, and have two dogs named Waffles and Obadiah to fill their empty nest. Father Mike enjoys serving our Lord and is looking forward to being in beautiful West Texas.